*We’re not affiliated with either Google or GoDaddy, although we use both companies’ products. That’s it! Hope this helps. I followed your instructions here exactly, and on step 9, it keeps giving me this error message ”	Authentication failed. Please check your username/password. What can I do to fix this? I am 100% sure I’m using the correct email and password. I tried using other ports and those give a different timeout error message. Hey Krys, were you able to set up your account to receive email, but not send? I’m having the same problem…able to be forwarded messages from my godaddy email, but not able to send as them and I’m being give the same error message. Thanks for the info. Much more helpful than our company’s IT guy! These instructions were exactly what I’ve been doing for days, yet with no luck. I’m also receiving the 535 Authentication Failed error. I’ve seen many posts about selecting “Full time SSL” within godaddy, but that option appears to be gone now. Is there anyone out there who’s been able to make this work, or is it a total loss? Having the same problem….please help! There are a few reasons you might be getting the 535 error, so we can try to narrow it down. Do you use Cpanel email or Workspace email? And did you recently switch from one to the other, or is this a new account? I’m having the exact same issue. Just transferred the domain to godaddy about 2 weeks ago. I can recieve emails via pop, but when i try to set up the smtp part i get that 535 error. I’m set up with Workspace. I read an older post that says there used to be a way to set up something like consistant ssl on the workplace settings, but that doesn’t exist any longer. Has anyone found a way to get around this 535 error? Thanks this guide was so helpful! I hate how gmail changes and restricts their settings so often. Thanks Eric! Glad you found it useful. Simply remove the original entry for “Check mail from other accounts” and try doing the steps for “Sending Email” first (steps 7-10) before going back to steps 4-6. We’d love to hear if this helps anyone, so drop us a line after you give it a try! I’m able to send emails from the godaddy account but still get the same SSL error message when trying to setup the “check mail from accounts”. I hope someone will find out how to fix this. I’ll continue to look for a solution. It looks like the SSL certificate isn’t good enough for gmail. having your own certificate should fix the issue. I don’t need one so I’m not sure I’ll be able to fix this. I may just forward all emails from godaddy to gmail instead. Hey Mike – I’m having the same issue. I tried removing the original entry and everything! Any other advice? You’re welcome! Happy you found it useful! I am unable to set up the my GoDaddy email as a “Send email as” address. I get the following error message: Oops, we weren’t able to finish. Please verify that you have entered the exact settings provided by your other email service. Contact your other email administrator for further details. If that doesn’t work, let me know if you’re using Cpanel or Workspace email. I am using Workspace Email and continue to get the 535 Authentication Error when trying to setup the SMTP server. The POP3 receive server is working fine. I was having the same issue and was able to SOLVE it by changing my Workspace email’s password and waiting 30 minutes for the “refresh” (GoDaddy’s Support lingo, not mine) to take effect. Tried again and I was golden! That’s great Arjun! Thanks for sharing this! You’re the second person to report changing your GoDaddy password solved the problem. Looks like a good option to try. Hey Mario, have a look at Arjun’s comment from April 1st. Apparently changing your GoDaddy email password and waiting 30 minutes is a viable solution. Arjun is the second person to report that fix as being valid, so it’s worth a try! I had the same error message: “535 Authentication Failed…”. I called GoDaddy support and they said the issue was the SMTP relays for my email address were not set in the GoDaddy email control center. The relays had to be reset. Once reset, it worked. 3. Search for the email address. Look at the Relays column. It is probably blank. It needs to be reset. 4. Click on the email account to edit it. 8. Go back to your Gmail > Settings > Accounts and Import section of Settings, look at the “Send Mail As” section and click “Add another email address that you own.” It should then work. Thanks for sharing a step-by-step solution to this Jane! GoDaddy support has been pretty helpful the times I’ve had to call in, and it looks like they came through for you too. If anyone else has a chance to try this solution, it would be helpful if you’d share the outcome here. “I had the same error message: “535 Authentication Failed…”. I called GoDaddy support and they said the issue was the SMTP relays for my email address were not set in the GoDaddy email control center. The relays had to be reset. Once reset, it worked. Awesome! Thanks for the confirmation Rickie! Will this work on cPanel email accounts? I can’t find a place to change those settings. Google tried to deliver your message, but it was rejected by the server for the recipient domain hnaudit.org by aspmx.l.google.com. [2607:f8b0:400d:c04::1a]. Oh my God, I cannot thank you enough – 7 hours I have sat trying to make this work and finally, following your instructions about resetting the SMTP Relays per day, IT WORKED!!!! Thank you soon much, I am sending you a virtual hug!!! You’re welcome Heather! I’ll be sure to pass on the thanks to GoDaddy tech support next time I speak with them 😉 And of course janeOc for sharing in the first place. I created a ‘free email forwarding with domain’ only (not have any email password set), but did not purchase any ’email plan’ or owned other ‘free email credit’. 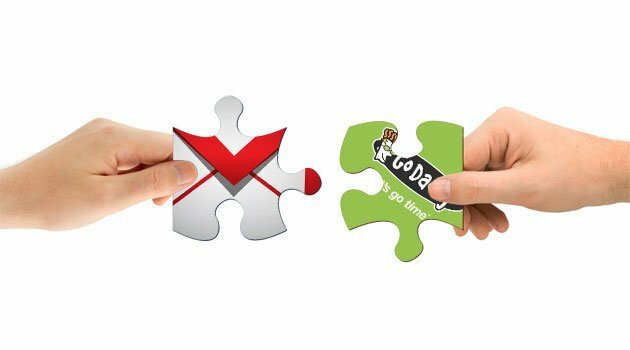 can I still use the ‘send email as’ function from gmail to godaddy? Hey Howard, sorry for the delay. Have been on vacation for a while 🙂 Yes, you should be able to use that functionality with Gmail. The settings should be the same as other accounts. Hey then what password are we suppose to use for the forwarder email ID setup on gmail? I haven’t purchased any additional email plans but have got free forwarder email Id’s with the domain I purchased. When I created forwarder email id on godaddy, there was no option to setup a password for the id. You would use whatever password you use to log into your GoDaddy email account. You would not use your general GoDaddy account password. Unfortunately you won’t be able to do this with a forwarding address. It’s not a real email address in the way that you and I think of it. You can’t send from that address, and you can’t really receive either – you can just re-direct incoming email to another address. They can be handy as an add-on address that you’ll never send email from. We used to use a forwarding address for info@sparqstreet.com – incoming mail would come to that address, get forwarded to the appropriate parties, and we’d then respond from our own email address. You’ll really need a standard email inbox to do what it sounds like you’re looking to do. THANK YOU SO MUCH FOR THE BONUS! No more delay. I bow to you. Thanks for the tip Lokanath. I’ll update the article to reflect region-specific servers. Europe has it’s own server, smtpout.europe.secureserver.net. Godaddy always has to make things difficult. I wasn’t checking the ‘always use secure connection’ checkbox which was tripping me up. Now everything is working though. This is best far the best resource on the subject. Thanks dude! Does this process work only with Godaddy hosting? I & 1 as my hosting site but the domain is from Godaddy. My info@——.com is setup with 1&1. The principals from the instructions should apply to other shared hosting providers, although I haven’t tested that. It would be great if you could try it with your hosting provider and let us know if the settings are compatible! smtpout.asia.secureserver.net and tried all the port settings with the SSL option marked. My username(email) and password is correct with godaddy. Oops, we weren’t able to finish. Please verify that you have entered the exact settings provided by your other email service. Contact your other email administrator for further details. All of our accounts have relays set to 250. I’d expect that setting relays to 0 wouldn’t work. One of the earlier comments had to do with resetting relays. This is different than changing the setting to 0. Try changing this back to 250. You can also try contacting GoDaddy and having them reset the relays from their end. Be sure to let us know if it fixed the problem! Hi i have a godadday server, mails configures of different domains are not able to receive mails from gmail but can send mails. Google tried to deliver your message, but it was rejected by the server for the recipient domain celebratingmumbai.com by smtp.secureserver.net. [68.178.213.37]. Your instructions are great- worked for me! One question I have is whether I can respond from this email address I added via my phone (iphone)? I’m not sure how to add this email address as an option when I want to send email via phone….? Glad we could help Amanda! GoDaddy does have instructions here, although I can’t vouch for their accuracy or ease of use. Dude, you are awesome! Thank you SO MUCH for these excellent instructions. I was banging my head against a wall all day yesterday. You rock. thank you so much for this – i have been trying to do this for years! Hi I am using godaddy office 365 email address. How can set up my gmail in order to send message on behalf of the godaddy message ? I’m a little unclear about your question as you’ve mentioned Office 365, Gmail, and GoDaddy. I’m afraid I don’t have any experience with Office 365 anyway, so I’m probably not the best person to answer your question. Hi Guys, problem 552 here, anybody on the same boat? Its killing my days.. Sorry Federico, no experience with that here. Out of curiosity, are you using cPanel email or Workspace email? What I can say is that we’re looking at moving away from GoDaddy email. We’ve been having deliverability issues almost since day one. My guess is that’s why they’re partnering with Microsoft in offering Office 365 for their higher-end email. Looks like there are others with the same issue. Please do let us know, however, if you find a solution to the problem that doesn’t involve leaving GoDaddy. I tried to access Godaddy workspace email all day but still not… is it need to pay for mail storage? We’re not affiliated with GoDaddy in any way so I wouldn’t presume to speak for their service packages or policies. You’d be best to contact GoDaddy customer service and determine what services you have included in your package. My advice would be to ensure to have an actual email account, rather than simply a forwarding address. An email account will offer you mail storage, whereas a forwarding address will not. hi, we have a webmail login but there are showing the error “please contact customer care” i connected customer care and they created mail but it is not showing on workspace email. I’m afraid I can’t offer much in the way of assistance here. It sounds like something you’d need to address with their technical support people. It may be of some relevance that GoDaddy is no longer offering their Workspace email to new users. They haven’t shut down the service yet, but I suspect they may not be dedicating many resources to maintaining that platform going forward. Just a guess, though. I already did this and I am sending emails from Gmail. But emails are not properly authenticated. DKIM signed, SPF authenticated ? DKIM and SPF will help improve email delivery rates and give you a bit more credibility with email recipients. You’ll need to set those up in your DNS. We’ve recently moved our email to Zoho and they have a pretty good guide on how to set up DKIM and SPF. Do you mean I cannot set up from GoDaddy to Gmail anymore? based on #36. I don’t think #36 is relevant to what we’re doing here. We’re using Gmail as an email client, similar to Outlook, Thunderbird, etc. I don’t see GoDaddy forcing users to use their web client. You’re quite welcome Mariana 🙂 We’re really quite happy people such as yourself are finding it useful! **** URGENT HELP HERE …. OK guys … my head is about spin off on this email hell I am in. a) was on BlueHost: they went from A to F on many levels, time to move on NOW. Got to move. For my small COMPANY, not personal fun time. b) moving NOW to Godaddy, where I thought my company would never land years ago. All seemed perfect fit UNTIL E-MAIL HELL (transition) began. Still want to go to Godaddy. Impressive except for email issue. 1. I currently use Gmail as my hub for 4 outbound/inbound different email accounts. Different names. BlueHost has a specific page explaining how to use Gmail for email. TSL/SSL … got it set up. Works. 2. Godaddy not a fan of this. Not a fan of working w/ Gmail. 3. I may LATER use Microsoft 360 from Godaddy, but not right now. Includeing their email. a) can I just use same set up configuration BhueHost used for Gmail set up … BUT sub Godaddy name where applicable? b) does Google Works (?) have a solution here? I do not use Google Docs but keep hearing it is a solution. Lastly, my Tahoe was hit by an 18-wheeler going 65mph to my 15mph. I am will home bound recuperating for 8 weeks. Working from only, but painful. Need fast resolution to THIS E-MAIL ISSUE to move away from BlueHost ASAP. And over to Godaddy NOW. Anyone that can offer assistance. I personally appreciate. Hey when I try to set it up as “Send mail through your SMTP server” I follow everything but it gives me “Your other email provider is responding too slowly. Please try again later, or contact the administrator of your other domain for further information.” anything I can do? The only thing I can suggest is checking all the settings and making sure they’re exactly the same as in the post. Be sure you’re using the appropriate settings for either cPanel or Workspace. Otherwise, feel free to shoot us an email and we can chat about troubleshooting for you. Thank you so much for this, worked like a charm. This worked perfectly for me. Thanks very much. I did have to wait a couple of hours for Google to update the setting allowing sending of mail using outside SMTP servers but it’s fine now. i try to use outlook 2016 to set up the godaddy’s workspace webmail…i follow the email setup instruction to set up IMAP and SMTP..but the password confirmation page keep popping up while using smtp server to sending out the email. in my godaddy’s webmail, there is no any icon to change the relay (my relay is 0/-250)..i also try to change the password but still can’t solve this problem…Can someone tell me how to solve this problem?? My thoughts without actually having a look into the system would be a wrong username or password. Be sure you’re using the password for that email account and not your GoDaddy account. Also be sure that your username is your entire email address, including everything after the “@”. If you’d like us to troubleshoot for you, feel free to shoot us an email! It’s all working great. Thanks for the advice. I am unable to reply directly to emails through my godaddy email address. It goes directly from my gmail account. please help. Thanks so much man! I design websites and have struggled with providing my new clients with this service. Changing the relays to zero and back as well as the password did it! Cheers!! Glad it helped you Paul! I’m stoked that other commenters (like janeOc with the relay reset) have contributed so much to the article that it’s become a solid resource. Cheers! Nice tutorial, thanks for creating this. Great information. It sounds like you have the solution, but where do you reset the relay on cPanel email? Hey Richard, I’ve never had to reset the relay on my account but near as I can tell you’ll have to call GoDaddy support in order to do that. I don’t think it’s something that can be done from the user’s side. Great post. I read your reply that Gmail “send as” alias wouldn’t work on Go Daddy email forwarders (it’s workspace mail, IIRC). But I had it working fine up until two weeks ago, when something changed (not sure where). I now get this error trying to send email out as my alias using Gmail. Any thoughts? Google tried to deliver your message, but it was rejected by the relay smtp.gmail.com [74.125.69.108]. Hey Anita, every time I’ve seen a “Username and Password Not Accepted” message, it’s been just that. Try resetting your GoDaddy email password so you’re 100% sure what it is, then enter that password into the appropriate fields in Gmail’s settings. Also have you tried turning off the Alias setting in Gmail? I haven’t found it to be a particularly critical option, and some people have reported problems when having it turned on. Awesome post – super helpful! worked like a charm – especially forward a copy hack! Eureka! Nothing else worked. Thank you! Mad Props! This guide is really in depth and informative. Thanks! Hey Tyler thanks for the love. Glad you liked it! This tutorial was immensely helpful and saved me tons of time. The fact that you listed the servers and the ports for incoming and outgoing mail was invaluable. Thank you so much for providing such a valuable service. It was quick and easy with the step by step instructions. Thanks for taking the time to comment Catherine, and for giving such good feedback. Glad we could help! Glad we could help Warren! And yes… getting my mail in Gmail would vastly improve my disposition, especially around tax time. This is my favourite. You made my night. Thank you! I have tried my gmail password and go daddy password. I tried changing the go daddy password and attempting that as well but no luck. Do you have any suggestions? The only thing that comes to mind is to check which password you’re using. The password you enter into Gmail in steps 6 and 9 is the username and password for a given email account, not the username and password for your GoDaddy account. If you’re definitely using the Email account password, then I’d check to see if you’re able to access the email account directly with that username and password. There could be an issue on GoDaddy’s side, so it might be worth contacting them to see if there’s a problem. Yes, changing the GoDaddy webmail password worked for me. Didn’t even have to wait 30 mins. Thanks very much!